Pacific, Mo. 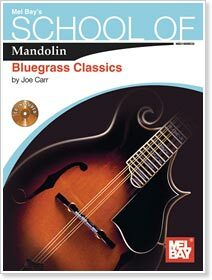 — Mel Bay Publications, Inc. has announced an addition to their popular School of Mandolin series with author Joe Carr presenting special arrangements of 29 classic bluegrass instrumentals. The basic melody is presented using quarter notes and a maximum of four consecutive eighth notes resulting in very playable and true arrangements for beginning to intermediate players. "Bluegrass Classics is a book I wrote to help my students who have trouble sustaining long phrases of eighth notes. These arrangements retain the basic melody while being easier to play," said Carr. Got my copy today. I've got all of the "School of Mandolin" books by Joe Carr and enjoy and use them often, but I'm a little disappointed with this one. It's advertised as a beginner/intermediate book, but I found the pieces to be over simplified and should possibly be listed as a beginner's beginner book. On the other hand I ordered this for a friend who does struggle with pick direction, so in this sense it is a valuable resource.